Courtesy of Fernando Betanzos Tenorio, Maratón Acuático Ruta del Arrecife, Puerto Morelos, Quintana Roo, México. Fernando Betanzos, race director of Mexico's Maratón Acuático Ruta del Arrecife, announced the details of the February 25th 2017 race that starts at the Puerto Morelos Main Pier. Age divisions for the 1.25 km, 2.5 km, 5 km races are 11-12, 13-14, 15–18, 19-24, 25-29, 30-34, 35-39, 40-44, 45-49, 50-54, 55-59, 60-64, 65-59, 70-74, 75-79, 80-84, 85+. 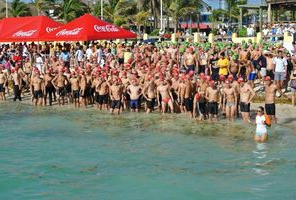 The rectangular course are loops protected by Puerto Morelos Reef with 2-meter high red and yellow buoys with a feeding station available on the pier. The start and finish are in the water at a floating pontoon. There will be 5 different color caps and officials will identify infractions by athletes with a whistle. The race is in tropical waters of the Yucatán Peninsula, about 36 km south of Cancún amid an old coastal fishing village and site of the Mesoamerican Barrier Reef System, a National Marine Park. For more information, email Betanzos at fbetanzos@infowest.com or visit www.asdeporte.com or www.protudec.com. Could you provide the URL's again separately? These links don't seem to work for me, and I'm interested in an early season event. Email Betanzos at fbetanzos@infowest.com or visit www.asdeporte.com or www.protudec.com. Good luck.